In the 25 years of Força Sindical review the interview with Joseph Ibrahim , one of its founders. Follow this week , other interviews on the history of Central! Metallurgist, worked in the factory Cobrasma, in Osasco (SP), where, as President of the local Union, was one of the protagonists of the strike of 1968. He participated of the foundation of Força Sindical, and was First-Secretary of International Relations of the Center. I am a person who has History in the Union movement. I come from behind, from the fight of resistance to dictatorship. This fight we made there in Osasco (1) cost me prison, torture, ten years of exile, all this stuff. I was founder of PT and I also helped to form CUT. But I stayed more inside the party. While Lula (2) as the President, I was the Secretary. I had several politic divergences in PT, and in 1986, I left the party. I went to work with Brizola (3). Soon I left PT, during a cocktail in the Metallurgists Trade Union of São Paulo, by the time Joaquinzão (4) was the President and (Luiz Antônio de) Medeiros Vice, I said to Medeiros that I felt the necessity of creating a different Center, which contemplated the Union action and fight, out of the monolithic view we had. In the head of some people, mainly the leaders of CUT, the unionism was divided between the revolutionaries and the bosses alike. I did not agree with this, and I thought there were conditions of creating alternatives to the Union movement. But when I talked to Medeiros, he answered me that the Metallurgists Trade Union of São Paulo, by itself, already was a Center. I disagreed, and said that, for stronger the union was, for better it is its History, it represents only one category. The conversation came to an end. Times after, in 1989 or 1990, Juruna (João Carlos Gonçalves), of whom I always was good friend, looked for me to say that Medeiros wanted to talk. He wanted to take back that conversation we had, and he said that he was already talking about the subject with several leaderships. “We are alike to build that Center you had talked about. A different Center, with other vision. Are you on board to join this initiative?”, said Medeiros. And I answered yes. There was space to build another path, combative, but not narrow, or even sectarian. While CUT was very radical, CGT was very conservative. The Unions of CGT had not power of negotiation. That Center was overrun. And that stuff of “unique center”, unique party, had already history. It was about cold war. We got together, then, a group who believed in this project: Medeiros, Araújo, of the Food Federation, me and several companions from Guarulhos and Osasco, where it was the Union I was president. I organized the first trips before the foundation. And we started to articulate the Center nationally. I went, with Medeiros, Alemão (5), and Araújo himself through all over Brazil, discussing the proposal of the Center. We debated with Meneguelli (6), with Vicentinho (7). That time, Medeiros, as he was the person in front of this new project, avoided debates. Then I had to do accomplish these complicated jobs of debating with the left wind people. We had a lot of time to talk and elaborate our first documents. When I was in PDT (Labor Democratic Party), I was very friend of César Maia (8), who was Secretary of Brizola. Before the foundation of Força I took to lead Medeiros to the home of Brizola. Such Maia, as Brizola supported the creation of the Center, and helped us in the elaboration of the first documents. Before the foundation, everything was very advanced. The conviviality was very big, and everyone knew their role. The beginning was difficult. The reaction against us was very big. CUT realized they would lose their hegemony, which there was a new force in the scene, disputing with alternative proposals for workers. Then, in order to burn us, they said “it was a Center who was born in the lap of Collor, that we were a “Collorful” Center, the “Fake”. They put a lot of stones in our path, inside Brazil and abroad. It was very difficult. I stayed a long time making speech in defense of the Center, which we would innovate the Brazilian Union movement. Which we will not create a unionism of cupola, party alike, but a pluralist, combative, claimer and of fight Center. Medeiros, Juruna, Paulinho and I were tuned with the same speech: “we came to worth, to fight and argue”. But with a different vision. Despite this, the Center already was born strong, representative and with big insertion in several categories. Among the Metallurgists Unions that were in Brazil, taking out the ABC, we took the main ones. We already had a big representation in the areas of services, food, beyond other important categories, as textiles, the people of the shoes area. After this, Força was growing, and nowadays it is a respected and big Center. As I already had the experience of ten years in exile, period when I worked a lot with International Union Centers, mainly European, I was elected the First International Secretary. I build a whole path of respect in the international Union movement. We achieved our space with a lot of guts. The first Center which believed since the beginning in the proposal of Força, was UIL (Unione Italiana del Lavoro), which is a big Center and with a very strong history in Italy. They gave us a very important support. They helped us to build the Força Union School (9), sponsored by the Italians. But the International Confederation of Free Trade Unions (ICFTU) took some two years and a half, more or less, to accept our affiliation. While we were not admitted at ICFTU, we kept many bilateral relations and exchange with the Centers of France, Spain, and Italy. We also established a good relation with China. The first big delegation that went to China, by invitation of the Chinese Union Center, was leaded by Medeiros and me. We also went to Japan. And we kept occupying space. We also occupied space at ILO (International Labor Organization). For eleven years in a row, I headed the delegation of Força in the ILO Annual Conference. Before the foundation of the Center, Medeiros was really like to have an interview with the Pope. As I was the International Secretary, this was my job. And then Romano (10) and I worked towards this. Romano was also keen to see the Pope. A little before the foundation, I made an agenda turned to Europe, to release and invite people for the creation of Força Sindical. By the channels I had in Italy, I asked to meet the Pope. It was difficult. We stayed more than ten days rolling through Europe and waiting to know if we would see the Pope or not. I did even not believe anymore, but Medeiros, every day, during breakfast, looked for us, in any Country we were, and asked about the visit to the Pope. Until they called me from Italy saying they agreed the conversation. We went to Italy. When I arrived in Rome, on the eve of the visit, I reminded I had no adequate suit and I told Romano. I had in the suitcase a tie, a blazer, but not a complete conjunct, a suit, proper to be received by the Pope. He said: “There is no problem. We go to a shop and you buy the suit”, and I: “By the way, it is not only one problem, I have two. I also do not have money to buy the suit”. Then Romano said the following: “Want to know? Let us there, I use credit card and I pay you the suit”. Then I bought the suit. In the meeting with the Pope, the ceremonialist said for us to wait for the time of the host, a tradition for these hearings. Romano, Medeiros and I kept waiting. When they called us, Romano was the first. I went behind and Medeiros pulled me by the neck of the suit and said that communist did not eat host. I turned to him and said: “But the one of the Pope I will eat. I will not miss it”. Then I went and Medeiros get there –he did not eat the host. The hearing with the Pope was very good. It took about fifteen minutes. We explained to him what Força Sindical was about. There were translation – the Pope has a translator. We asked for his comprehension and blessing, since Brazil is a Christian Country. The Pope blessed the Center and wished us good luck in workers defense. It was good. We went out there and took that historic picture – Romano, me and Medeiros with the Pope. When Força Sindical was born, it was time of the Presidency of Fernando Collor. (11) He knew he had to negotiate with the Union movement, but with CUT and senile Federations and Confederations, there was no negotiation. We had no tacit alliance with Collor, but he realized he could talk with us. And Força always looked for the institutional negotiation. In the decade of 1990, when I belonged to the Center, we talked a lot with Itamar Franco (12), about the participation of workers in spaces of discussion, and we raised, since that time, the banner of the affordability of the retired and the recuperation of the minimum wage. We also had a lot of dialogue with Fernando Henrique Cardoso (13), in his two governments. It was in the period FHC that we achieved a space of participation, to give our opinion, in the Councils of the Guarantee Fund, Fund of Support to Worker and BNDES – where we charged investments, job generation and decent work, among other stuff. Paulinho is a leadership with very keen sense of opportunity, and I see this as a quality. He has a very good sensibility to realize things quickly. He is rapid fire trigger. Medeiros has a more solid politic formation, but Paulinho is more high flying and impetuous, which defines a profile, a different style of actuation. While Medeiros, in the Presidency of Força, was more cautious and has a style more cool, Paulinho, in a certain way, was more dashing. In general he does right, and today he is, in my opinion, the main union leadership in the Country. He exerts a mandate in defense of worker, what dignifies Força. Forca Sindical played a fundamental role in the renovation and oxygenation of the Union movement. I am proud to participate of this process. To exert this supreme right to citizenship – which is the political participation – workers have to organize, has their own tools and voice in society. Because of this, workers need a Center as Força Sindical, which, in these 20 years, became the one of the best channels of participation of workers. It is a very important tool to build a strong democracy in Brazil. Although there is still a lot of things to do, the Union movement advanced a lot in these 20 years, and the walk of Força is victorious. (1) Strike of 1968, in Osasco, initiated in the metallurgist factory Cobrasma. (2) President of Republic from 2003 to 2006, and from 2007 to 2010, Luís Inácio Lula da Silva was President of the Metallurgists Trade Union of São Bernardo do Campo, from 1975 to 1980. He was also one of the creators of the Workers Party (PT), in 1980 and of the Unique Workers Center (CUT), in 1983. (3) Leonel Brizola was a Brazilian politic, member of the Labor Brazilian Party (PTB), of Getúlio Vargas. One of the biggest naysayers to the military dictatorship, his name would be in the first list of revoked by the Institutional Act Number One, in April 10, 1964, with 102 people including João Goulart, Jânio Quadros, Luís Carlos Prestes and Celso Furtado. When he came back to Brazil, with the Amnesty of 1979, Brizola wanted to assume the old legend (PTB), but he lost the register at the Electoral Superior Court (TSE) to Ivete Vargas, niece of Getúlio. Then, he founded, with other historic labor leaders and new sympathizers, the PDT. 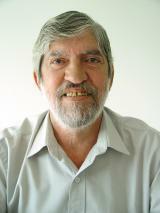 (4) Joaquim dos Santos Andrade, Joaquinzão, was President of the Metallurgists Trade Union of São Paulo, from 1965 and 1987. 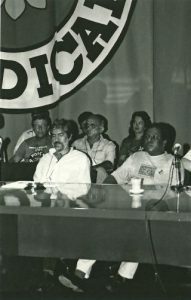 (5) Enílson Simões de Moura, metallurgist, participated of the organization of the strikes of 1978 and 1979, at ABC, and was Secretary-General of Força Sindical between 1991 and 1997. (6) Jair Meneguelli was President of CUT from 1983 to 1994. After, he was elected Federal Deputy. (7) Vicente Paulo da Silva, Vicentinho, was President of CUT from 1985 to 2002 and also elected Federal Deputy. (8) César Maia, economist and politic, belonged to the staff of PDT until 1991, when he broke up with Leonel Brizola. He was major of the city of Rio de Janeiro for 12 years. (9) Project of School of Union Formation that Força Sindical made in the decade of 1990. The UIL, with the Union Center ELA-STV, of Basque origin, helped to buy the building for the functioning of the School, in Embu-Guaçu (SP). (10) Rubens Romano was President of the Shopkeepers Union of São Paulo, and Secretary of Finances of Força Sindical, by the time of its foundation. (11) Fernando Collor de Melo was President of Brazil from 1990 and 1992. He was the first President elected by direct vote after the military regime. He renounced the post in order to avoid a process of impeachment. But the process proceeds and he had his rights suspended for 8 years. (12) Itamar Franco was Vice-President in the government Fernando Collor. He assumed the Presidency of Brazil with the renounce of Collor, in 1992. During his government it was idealized the “Plano Real”, elaborated by the then Ministry of Finance Fernando Henrique Cardoso. (13) Fernando Henrique Cardoso, sociologist, was President of Brazil from 1995 to 1998, and from 1999 to 2002. (14) Dilma Vana Rousseff is President of Brazil since January 1st, 2011.